Less than a year into his role as the Canadian auto sector's chief evangelist, Ray Tanguay says he's opening eyes and changing the minds of global industry decision makers, but there's more work to do. "We have to keep selling hard the benefits of Canada," said Tanguay, 66, who retired in March 2015 from his job as chairman of Toyota Motor Manufacturing Canada Inc. He spent 24 years with the company. Canada's "car czar" had intended to ease into his new job, but that didn't happen. It started with a bang. "Next to Silicon Valley, [Canada is] the biggest IT cluster in North America." Widely seen as one of Canada's most successful automotive executives, Tanguay was named in June 2015 as special automotive adviser to the federal government and the government of Ontario and as chair of a subcommittee of the Canadian Automotive Partnership Council. Tanguay has been on a whirlwind tour since his appointment, meeting with politicians, auto executives and travelling to international auto shows to tout Canada as a global manufacturing powerhouse. He's making a lot of presentations to drive home the message, and his team is working on creating documents to show Canada is indeed more competitive on the world stage, "even compared to Mexico." His pitch is straightforward: wages are only a small part of the total cost of manufacturing vehicles. He says if investors factor in savings from Canada's healthcare system, lower taxes, skilled labour and some 29 JD Power and Associates quality awards, it only makes sense to locate in Canada. Further, he said, Ontario has the advantage of being close to other U.S. manufacturing centres in the Great Lakes region, which helps cut logistical costs. 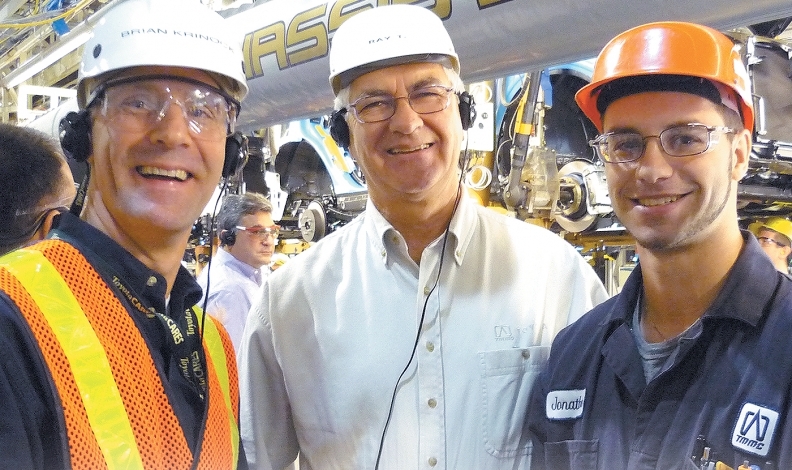 Tanguay knows a thing or two about costs and winning investment and manufacturing mandates. When he began at Toyota in 1991, the company manufactured about 50,000 vehicles a year in Canada. Now it's more than 10 times that number. The first time Toyota decided to build a Lexus vehicle outside Japan, it happened under Tanguay's watch, in Cambridge, Ont. In 2009, Toyota established a new RAV4 manufacturing plant in Woodstock, Ont. But he says he won't be Canada's special adviser forever, and he can't do the sales job alone. If Canada wants to really have an impact and attract auto assembly investment, it will need to create and fund an organization dedicated to that goal, an organization similar to Mexico's ProMexico that offers a "one stop shop" to facilitate and guide would-be investors through the process of setting up operations, he said. Canada's multiple layers of government can seem complex to outside investors, Tanguay said. Further, some Canadian jurisdictions seem to have an attitude of negotiating with investors rather than facilitating investment. "You have to be always ready, so if some investors come to you, you have to be ready to act." The question Tanguay and others have to wrestle with now is how such an agency would be structured and funded. One Canadian advantage, Tanguay said, is that governments are interested in helping companies continue to improve and grow. It's a philosophy that was well received in Japan and one that Tanguay says aligns with his own outlook. He said that one reason he went to work for Toyota after 19 years in the electronics industry was because the company embraces the philosophy of "Kaizen," or continuous improvement. "You don't invest for the present, you invest for the future. And this is where I think we really have an advantage," said Tanguay of Canada's prospects. "We've got some 40 universities and colleges involved in automotive research in Canada, and we have some of the best engineers coming out. "Next to Silicon Valley, we are the biggest IT cluster in North America." Low-wage, low-skill labour is the opposite of where the auto sector is going today, he said. Cars will be less a commodity and become more advanced products, loaded with computers and integrated into transportation and communications infrastructure. "If you look at the direction of the auto industry, you hear about Apple, you hear about Google, you hear about Tesla; these are technology disruptors [and] they are now interested in what the auto industry has to offer. "Because it is now about more than just moving people around. It's about total mobility connectivity." The vehicle will become a much more complex component of that infrastructure, he said, and Canada is well positioned to exploit that trend.